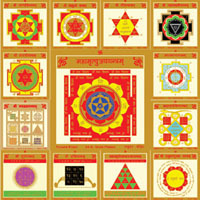 Introduction: This yantra is useful for destruction and defeat of enemies, whether they are visible or invisible. 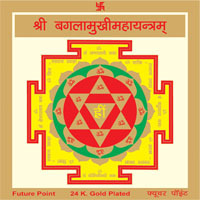 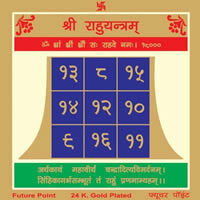 Method of Use: Place this yantra before you in a good muhurt, wear yellow clothes and recite Baglamukhi Mantra 36000 times on beads of turmeric. 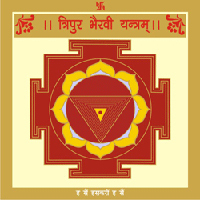 Flowers of priyanger, marigold and oleander (kaner) are used in worship of Goddess Baglamukhi. 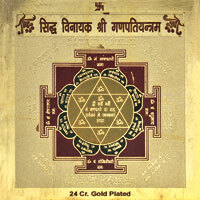 Mantra: "Om Hleeng Bagalamukhi Sarvdushtanaam Vacham Mukham Padam Stambhay Jeevhaam Keelay Buddhim Vinashay Hleeng Om Swaha"